The Rolling Stones Song of the Day is- the most famous song on Their Satanic Majesties Request- She’s A Rainbow. It is also by far the best song on the album. 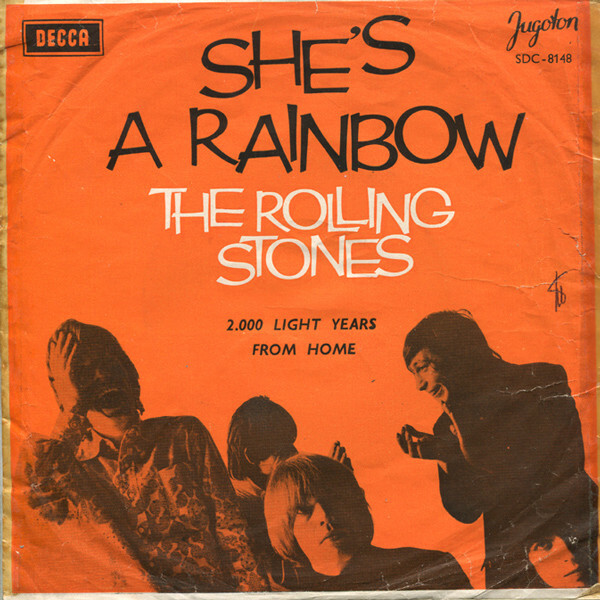 This song one of the soundtracks of The Summer of Love has been called by one critic- ‘the prettiest and most uncharacteristic song ‘ that Mick and Keith ever wrote. The single only made it to #25 on the Billboard Hot 100 which somewhat surprises me. The arranger of the strings on the song was John Paul Jones later of that little outfit called Led Zeppelin. The trippy song has been used over the years in commercials- I recently heard it on one- not sure who it was for. The Rolling Stones produced the song- as they did the album- the first one they produced- Andrew Oldham and The Stones having parted ways. I didn’t hear this one until I was in college. It was an instant favorite. A fabulous song with one of the best piano intros ever. I’ve heard from various big time Stones fans who aren’t particular fond of the tune. I’ve liked it from the beginning. Other tunes on the album are certainly more of an acquired taste. I can’t imagine some of these songs on Their Satanic Majesty’s Request getting much love but who knows. A mixed bag. I like 2000 Light Years From Home, 2000 Man and She’s a Rainbow of course from the album.